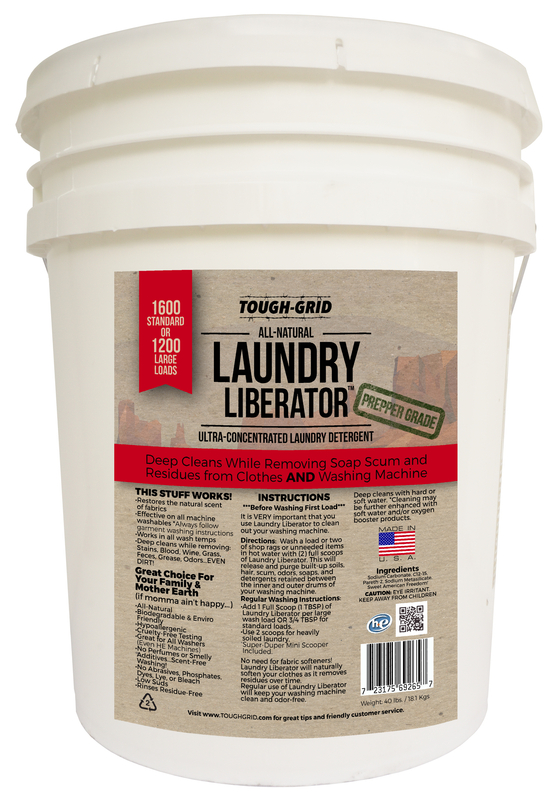 Laundry Liberator™ is a Prepper-grade, all-natural, ultra-concentrated powder laundry detergent that is ideal for anyone who loves clean laundry and clean living. This is no normal detergent. Laundry Liberator™ has the power to deep-clean your clothes AND your washing machine, freeing them from soap scum and other residues left behind by other detergents. Great for daily use AND long-term storage! Load for load, Laundry Liberator™ is one of the most cost-effective choices for your laundry needs! 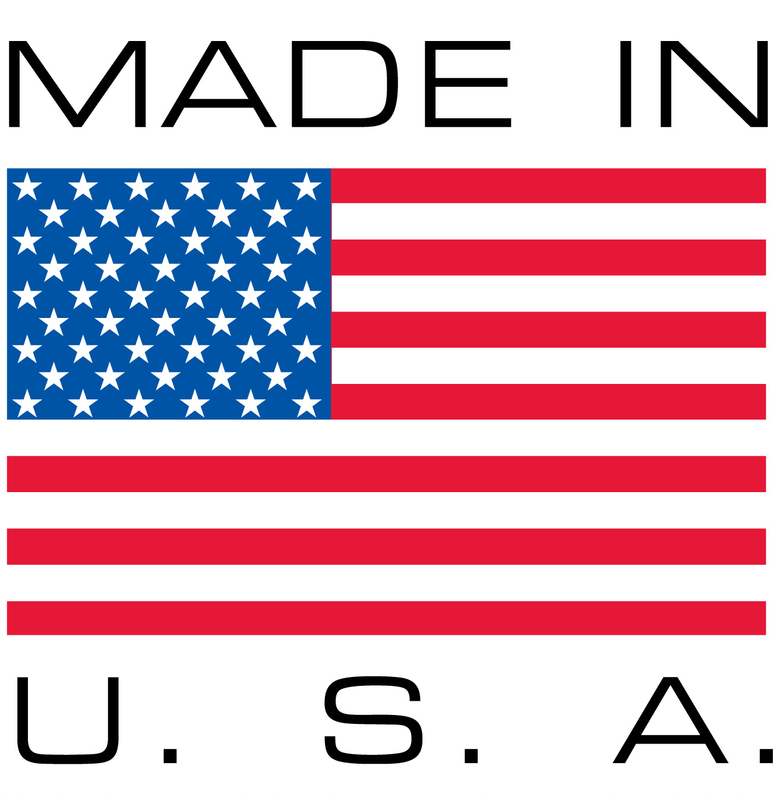 – As always, MADE IN USA! Sodium Carbonate, C12-15, Pareth-2, Sodium Metasilicate, Sweet American Freedom! These Ingredients are simple washing sodas, vegetable and mineral based surfactants, and anti-redeposition agents. 1. So… First things first, it’s VERY IMPORTANT to Pre-Clean your washing machine to get rid of old soap scum, nasty residues and buildup from other detergents and even old dirt and hair etc. How Do I Deep-Clean My Washing Machine Using Laundry Liberator™? You should deep-clean your washer by washing a load of rags or unneeded items with two full scoops of Laundry Liberator™ in hot water. The rags will help to facilitate agitation and removal of residues from your washer. You may want to repeat this process more than once, especially if your washing machine is several years old. Your clothes will get noticeably softer and cleaner the longer you use Laundry Liberator™. 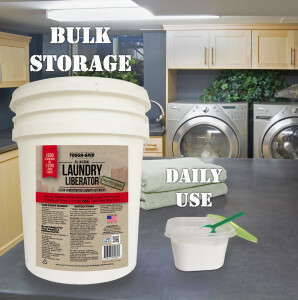 The Laundry Liberator Sample Package comes with a (1) tablespoon scoop included and you only need 3/4 of the scoop provided for a standard load and 1 full scoop for a large load. If you are running a heavily soiled load of laundry, you can run your load with 2 full scoops of Laundry Liberator. Start your washing machine as you normally would and add the correct amount of detergent based on your load size and level of dirtiness. If you have hard water, it’s best to use an oxygen booster, although it is not required… and that’s it! Run your washing machine as normal and your new detergent should wash away residue-free and leave your clothes cleaner than ever! What Is Being “Liberated” From My Laundry? 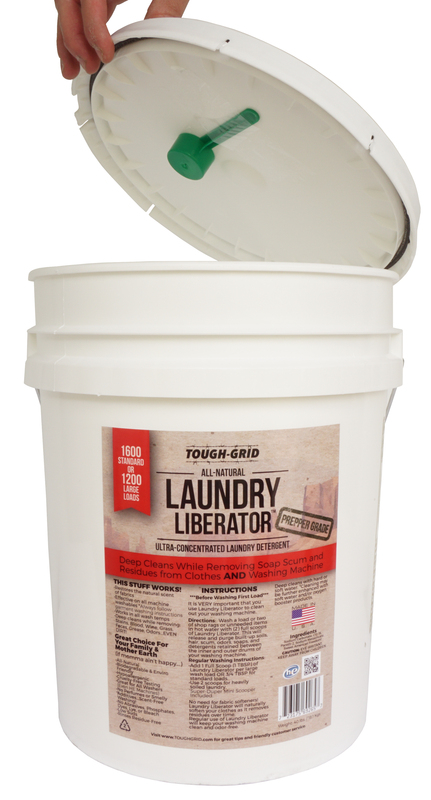 Tough-Grid Laundry Liberator™ doubles as an ultra-concentrated laundry detergent AND a washing machine cleansing system! Laundry Liberator™ cleans down to the very core of your fabrics and washing machine, liberating them from potentially harmful residues that can get into your skin. This is all done by using simple and natural washing sodas, vegetable and mineral based surfactants, and anti redeposition agents. Why Do I Need to Deep-Clean My Washing Machine Before I Do My First Load of Laundry? Prolonged use of other detergents can take their toll on your washing machine and your clothes. Other detergents leave behind icky residues that can, in some cases, be harmful. First-time use of Laundry Liberator™ will free up many built-up residues in your washer, this is why we recommend that you follow the deep-cleaning process before you begin washing your clothes. The deep-cleaning process will remove those residues and keep them from getting into your clothes. 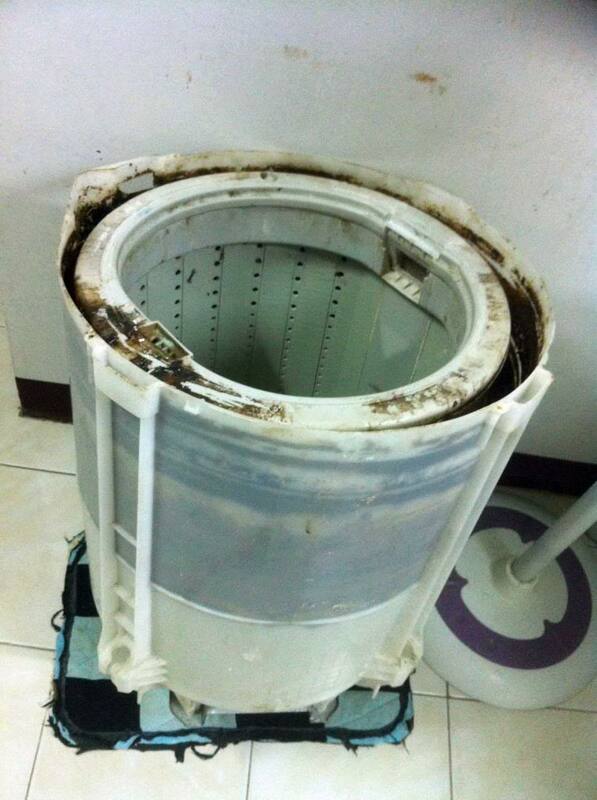 Obviously, not all washing machines will be this bad, but most machines will have similar buildup. VERY IMPORTANT! 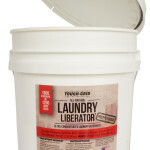 How Do I Deep-Clean My Washing Machine Using Laundry Liberator™? You should deep-clean your washer by washing (at least) one load of rags or unneeded items with two full scoops of Laundry Liberator™ in hot water. The rags will help to facilitate agitation and removal of residues from your washer. You may want/need to repeat this process more than once, especially if your washing machine is several years old. Old detergents will break away from your drum walls and cause an excess of suds and debris when liberating your washing machine of old soap scums and residues. You will need to run as many loads as needed to clean your washer from years of build-up. How Do I Know My Washing Machine Has Been Deep-Cleaned? Once you can agitate a load of just plain hot water (with no clothes or rags) and see very little or no suds at all, your washer is either completely clean, or mostly clean and the rest of the residues should flush-out harmlessly over time. Your clothes will get noticeably softer and cleaner the longer you use Laundry Liberator™ and residue build-up will no longer happen. Why Do My Clothes Look Splotchy, Bleached, Powdery, Faded, or Have Dark Spots? If your clothes have any of the problems above (or similar,) it most likely means your washing machine was not sufficiently deep-cleaned from the old soaps and residues hiding in between the inner and outer drums. Laundry Liberator (although a great detergent for clothing,) will “Always” remove residues from your machine and clothes. Your best option is to repeat the Deep Cleaning process (one or more times) as described above, and check to make sure it was fully cleaned (as above.) Once you are satisfied that it is fully cleaned, re-wash your ~splotchy clothes with a normal amount of Laundry Liberator and that “MAY” restore your clothes to normal. We say “MAY” because some of the residues may be bleaches left behind from long ago, and once liberated, they might have damaged your clothing in a way that is not repairable, especially if they were also dried after washing. Fading may also occur if your clothing is not colorfast, making them able to be washed without fading or having their colors washed out. 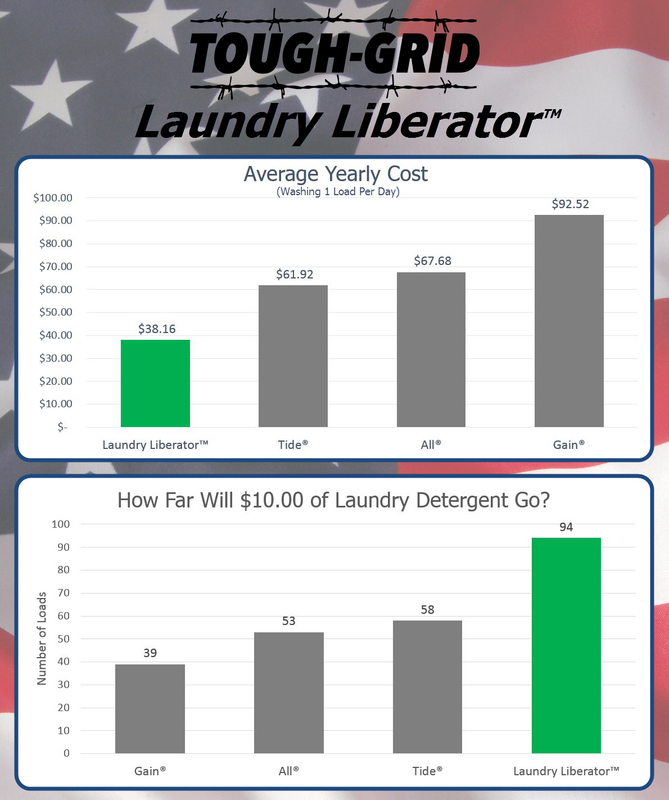 How Does Laundry Liberator™ Compare in Cost To Other Brands? Averaging .11 to .14 cents per load, Laundry Liberator™ gives you the value and cleaning power you expect in a bulk laundry detergent with the added bonus of a great residue eliminator. 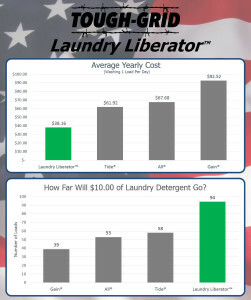 On the right side of the page, there is a chart that breaks down precisely the cost effectiveness of Laundry Liberator™ when compared to other leading brands of laundry detergent. The savings are obvious! Can I Store Laundry Liberator™ Long-Term? Laundry Liberator™ will be ready when you are! Our resealable bucket keeps the detergent fresh and powerful! “Preppers” agree that this detergent is a great item to have on-hand for long-term storage and if disaster strikes! 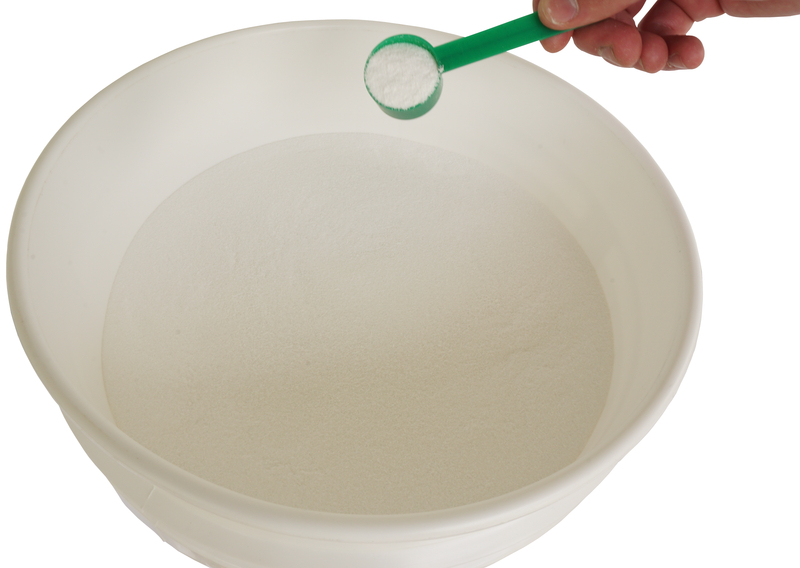 Will Laundry Liberator™ Get Clumpy Over Time Like Other Powder Detergents? Over time and according to the amount of humidity in the air, the powder may form small clumps, but don’t worry, this is normal. You can gently break up any clumps or just toss them into your washer and they will dissolve very quickly on their own. Laundry Liberator™ does not contain any artificial perfumes or fragrances. The only smell its going to leave behind is the natural smell of your clothes! Adding essential oils to each load of laundry in your dryer can be a great option for providing sweet smells. Is It Safe for Septic Systems? Being all natural, Laundry Liberator™ won’t cause any problems for your septic system. Don’t Worry! Our formula is hypo-allergenic, non-toxic, and rinses residue-free. Be sure to follow the initial deep-cleaning instructions to ensure removal of residues left behind from other detergents. If skin irritation occurs, try washing your garments three or more times consecutively, adding a new dose of Laundry Liberator™ each time. Use an extra rinse cycle, if available. This process will help to clear out embedded residues from your previous detergents. Does This Stuff Work on All Fabrics? Not all fabrics/garments are meant to ever see the inside of a washing machine. For example, some fabrics require only hand-washing or dry-cleaning. Be sure to follow garment care instructions. 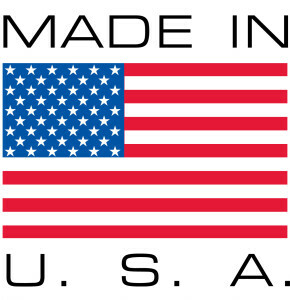 Laundry Liberator™ is an excellent option for all MACHINE WASHABLE fabrics. Will It Work In My HE Washing Machine? HE Washing Machines and Laundry Liberator™ go together like peas and carrots! Like traditional top-loading machines, there are plenty of settings to play with in order to best serve your laundry. We suggest that you use a setting meant for heavily soiled loads, this will facilitate better agitation and better use of the detergent. 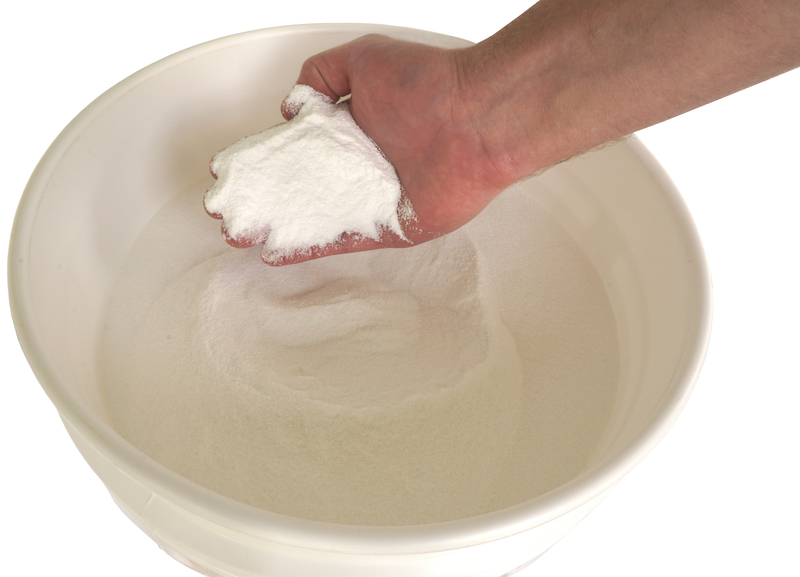 If possible, put the powder directly into the washing machine with the garments. Front-loading machines are notorious for getting stinky if they don’t get proper ventilation; we recommend keeping the wash door open when you are not using it. 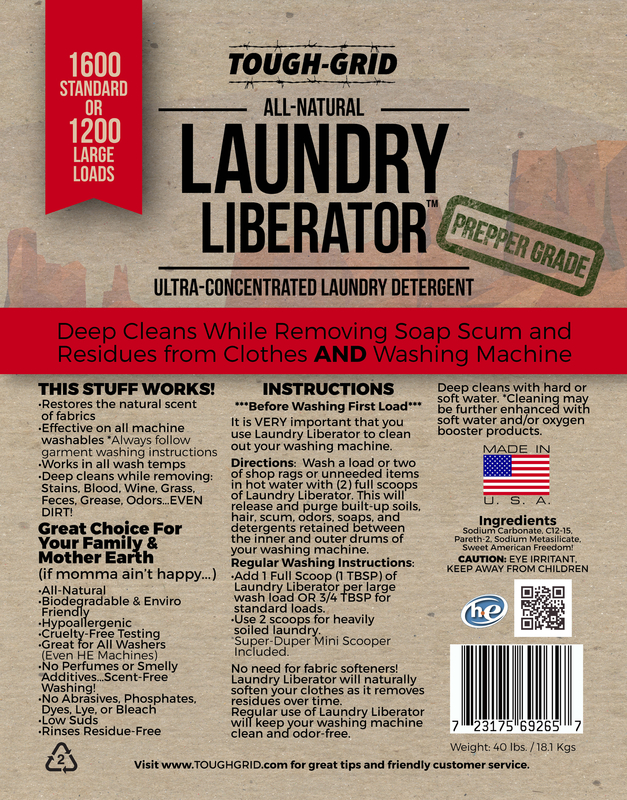 Will Laundry Liberator™ Work with Hard Water? Water hardness fluctuates everywhere you go. Laundry Liberator™ will work with hard water, but if you feel that your water is too hard, consider adding a booster product to each load. Products like Borax and Arm and Hammer Raindrops can help treat your laundry water and prevent hard water build-up. Is Laundry Liberator™ Safe On Colors? You shouldn’t have any problems if you follow all garment care instructions and check for colorfast. Garments without Colorfast may bleed or fade into other fabrics. Can I Wash Dishes or My Hands/Body With Laundry Liberator™? 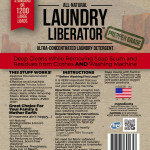 Laundry Liberator™ is listed as an all-natural and non-toxic laundry detergent. Although people do report using it for many other things with great success and no ill affects, we cannot legally suggest that it be used for anything other than laundry.